Matt Oppenheimer is co-founder and CEO of Remitly, a mobile company that offers international money transfers. Investors and vendors in the fintech industry have heaped plenty of hype on “mobile wallets” — products, often built by wireless carriers and banks, with a stored value of money accessed via a mobile device that can be used for a range of financial services, such as peer-to-peer transactions, merchant payments and money lending. Here is one data point to cut through the hype around mobile wallets: If you took a random set of 100,000 transactions in the money transfer business I run, roughly 19 of them will involve mobile wallets. A whopping 0.019 percent of these customers — generally tech-savvy folks using a mobile fintech service — use the service to send money to mobile wallets. A few years ago, I too was fascinated by mobile wallets. Before founding a mobile remittance company, I worked at Barclays Bank in Kenya — the country that’s the “shining star” of mobile wallet adoption. During my time there I understood the key factors that led to widespread use of Safaricom’s M-Pesa mobile wallet. Safaricom’s mobile wallet may have been a good or poor technology product, but that’s not what mattered. It succeeded because Safaricom owned 81 percent of the mobile customers in Kenya and because it operated a financial service in a favorable regulatory environment — Safaricom was partially owned by the Kenyan government. These conditions don’t exist in the vast majority of other markets. Mobile carriers around the world have tried to leverage their relationships with handset makers and mobile customers, but have failed fundamentally because the deck is rarely stacked in their favor as it was in Kenya. We’ve seen this with mobile wallets pushed by carriers in the Philippines, the U.K. and even the short-lived joint venture of three carriers that built a mobile wallet called Softcard in the United States. Amazingly, we’ve allowed this old metaphor — the wallet — to not only creep into the product’s user interface, but to define the entire segment of the fintech industry and the way these products are used by customers. The metaphor of the wallet isn’t serving a real purpose any more than the shutter sound of your phone’s camera. So if carrier-backed mobile wallets are failing more often than not, what could help mobile wallets go mainstream? Less involvement by mobile carriers and banks, and more knowledge about customers in developing countries. And the news is getting worse for mobile carriers. 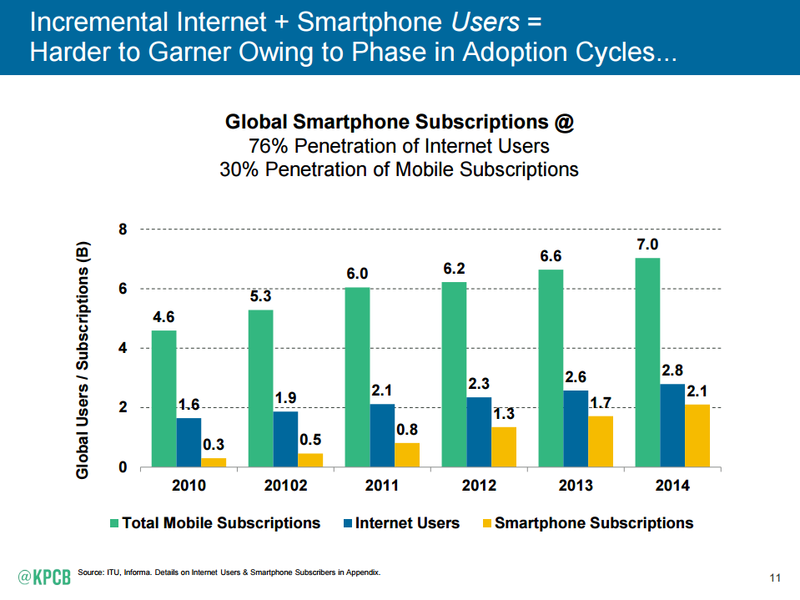 The rise of the smartphone in the developing world will accelerate the move away from carrier- and bank-dominated mobile wallets (see figure below from Mary Meeker’s 2015 Internet Trends Report). In the next five years, carriers will continue to lose their leverage with smartphone makers and, more importantly, mobile customers. This disintermediation is happening. Smartphones are now being sold directly to customers by the companies that built them — even using monthly payment plans to reflect the models used by carriers. Companies that don’t look anything like carriers and banks will gain new reach and relationships with mobile customers. The metaphor of the wallet isn’t serving a real purpose any more than the shutter sound of your phone’s camera. These new companies will reimagine the bundle of financial services that make up mobile wallets and parse them out to their customers as part of innovative insurance, micro-lending, merchant payment and other apps. Apps like WeChat will grow and deliver new financial services. The apps won’t have the logos of banks or the backing of mobile carriers. The technology companies that build them won’t have the billing and banking relationships with customers that the carriers and banks do, but they’ll have a deep understanding of how people use smartphones. This will spur them to compete purely to win customer satisfaction. Disintermediation will level the playing field among new entrants and entrenched carrier and banking competitors. Instead of advancing the status quo, disintermediation of mobile carriers and banks will lead to mobile financial services that solve real problems for customers. Future mobile wallet apps won’t have a leathery wallet user interface, they won’t be found in the “mobile wallet” section of app stores and investors who back them may not even realize they’re betting on what emerged from the mobile wallet hype.